After a good nights sleep everybody is fresh and ready to go. We start by heading north for an hour and a half up into the mountains of Jordan. At this point we’re only a short drive across the border to the sea of Galilee and then Israel. We start at one of the five pilgrimage sites designated by St. John Paul II. We have Mass at Our Lady of the Mountains Catholic Church in Anjara (Fr. Dan’s excellent homily here) before driving to Mar Elias (Tishbe) which is the birthplace of Elijah the prophet (1 Kings 17:1). We stoped at a wonderful restaurant for lunch and watched more fresh bread being baked outside in a huge domed oven. Next to one of the most well preserved ancient Roman cities called Jerash which is mentioned in the gospels as Gerasa (Luke 8:37). On our way back to Amman we visit the Jabbok River where I tell the story of Jacob the supplanter and deceiver. It was at this river that he was renamed Israel after wrestling all night with God (Gen 32:24-32). You display a bare cross in your homes; we display the cross and the crucifix. What is the difference and why? 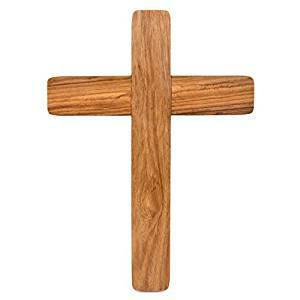 The cross is an upright post with a crossbeam in the shape of a “T”. 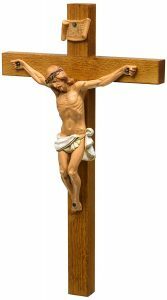 A crucifix is the same, but it has Christ’s body (corpus) attached to the cross. As an Evangelical Protestant, I rejected the crucifix—Christ was no longer on the cross but had ascended to heaven. So why do I now tremble in love at the site of a crucifix? Let’s examine the history and issues surrounding the two. Let me begin by defining “Protestant” as used in this article. First, it is used to describe the first Reformers who tore down crucifixes and crosses in the first years of the Reformation; and second, it refers to general American Evangelical-type Protestants. Granted there are many Anglican and “high” Lutherans and others that do not object to the crucifix or other Christian symbolism. With that behind us, let’s begin. Second, Protestants see the image of Christ on the cross as a violation of the command to make no graven image. The Reformers were big on this. Protestants now utilize plain crosses in their “churches,” on their walls, and around their necks, just as they have pictures of Jesus (always with soft skin and melodrama) on their walls. (I was raised with this feminine Jesus presiding, ever so romantically, over our dinner table. After spending time in the Holy Land, driving through the Judean wilderness, and ascending Mount Tabor, which he and his disciples frequented, I doubt he was so dainty and delicate; he probably had calves like a bear and smelled a bit like one as well.) However, at the turn of the last century, the Protestant churches (excluding Lutheran) were still pretty much opposed to displaying of the cross, even the bare cross. The bare cross was not in wide use until recently, though current Protestants don’t know their own history on the matter and that their predecessors opposed it as much as they did the Crucifix. Third, they object to the Crucifix because it is Catholic and to condone or display the Crucifix is to make a statement in favor of Catholicism. No one of “Reformed” persuasion would want to be identified as a Catholic. A bare cross seems to be generic, which is what most Protestants like–generic Christianity–with no history to criticize or Church to obey. Since the people in olden ages worshiped idols made of earthly materials [Endnote 1], God forbade the children of Israel to possess such “gods”. “Then God spoke all these words, saying, “I am the Lord your God, who brought you out of the land of Egypt, out of the house of slavery. You shall have no other gods before Me. You shall not make for yourself an idol, or any likeness of what is in heaven above or on the earth beneath or in the water under the earth. You shall not worship them or serve them; for I, the Lord your God, am a jealous God’” (Ex 20:1-3). To read this whole 14-page article, click here. To read Steve’s other articles, click here. For Steve’s talk “The Pain of the Crucifixion,“ click here.